If you have multiple drawings opened in AutoCAD at the same time and would like to save all the drawings before stepping away from your computer… you can easily save all the currently open drawings with one command. Note: If there happens to be an unnamed drawing opened (like drawing1), you will prompted to give that file a name. This command is an Express Tool so AutoCAD LT users will not be able to use this command. I think that this tool should be a part of AutoCAD and not an Express Tool. This entry was posted in Express Tools, Manage. Bookmark the permalink. Great tip! In 2014 versions (not sure about LT though) File Tabs are now standard (previously loaded with the midtab arx). If you right-click on the tab it also has a Save All feature as well as a couple of others. I have another question regarding text.. if dwg is done 2007/2008 & opened in 2012 certain font becomes oblique even though they r not italic or has 0 angle..this is font style-regular, font name-Arial black & Style- Sign. The only real downside is that it doesn’t refresh the thumbnail for the drawings so you don’t see them in preview areas like in Windows Explorer. What I’d really like (maye I need to write it) is a QSAVEALL command that just does a QSAVE on each drawing that is open. 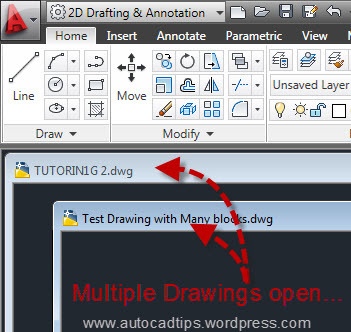 In LT place your cursor over one of the tabs of an open drawing, and right click. You will have several worth while options including “save all”, “close all” , etc.